Samsung Galaxy Note 2 launches on AT&T on November 9 | Android Blast! The Samsung Galaxy Note 2 will make its way to AT&T on November 9, 2012. The Note 2 will start at $299.99 and for that price you will have to sign a two-year contract. AT&T will start taking online pre-orders for the Note 2 on October 25, 2012. Beginning Nov. 9 customers interested in picking up a Samsung Galaxy Note� II will be able to purchase one for $299.99 with a two-year agreement in all AT&T* stores and online. Online pre-orders for this highly anticipated device are planned for Oct. 25 at www.att.com/galaxynoteii. Announced last month, the Samsung Galaxy Note II is one of the first smartphones launching at AT&T to feature a quad-core processor. Galaxy Note II uses a 1.6 GHz quad-core Exynos� processor with powerful graphics capabilities. The Galaxy Note II is thinner and narrower than the first Galaxy Note, and it improves upon the original with longer battery life, as well as enhancements to the S Pen�. AT&T is the only carrier to offer the original Samsung Galaxy Note� at $199.99 with a two-year agreement. 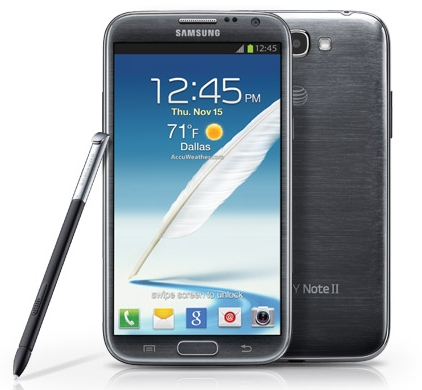 The Galaxy Note II will run on AT&T�s 4G LTE network. It will ship running Android 4.1 (Jelly Bean) on its beautiful 5.5-inch HD Super AMOLED� display, perfect for customers who want the productivity of a tablet with the portability of a smartphone. The 8-megapixel camera allows users to easily share their photos with friends through Share Shot, while S Beam� lets you quickly share videos, pictures, maps and more with other Galaxy Note II and Galaxy S� III devices. AT&T customers have access to the nation�s largest 4G network**, covering 275 million people. AT&T has two 4G networks that work together for customers, LTE and HSPA+ with enhanced backhaul. That means AT&T customers are able to enjoy a widespread, ultra-fast and consistent 4G experience on their compatible device as they move in and out of LTE areas. With other carriers, when you travel outside of their LTE coverage area, you may be on a much slower 3G network. Samsung, Galaxy S, Galaxy Note, Exynos, S Beam and Super AMOLED are trademarks of Samsung Electronics Co., Ltd. Battery power consumption depends on factors such as network configuration, signal strength, operating temperature, features selected, vibrate mode, backlight settings, browser use, frequency of calls and voice, data and other application usage patterns. AT&T Inc. (NYSE:T) is a premier communications holding company and one of the most honored companies in the world. Its subsidiaries and affiliates � AT&T operating companies � are the providers of AT&T services in the United States and around the world. With a powerful array of network resources that includes the nation�s largest 4G network, AT&T is a leading provider of wireless, Wi-Fi, high speed Internet, voice and cloud-based services. A leader in mobile Internet, AT&T also offers the best wireless coverage worldwide of any U.S. carrier, offering the most wireless phones that work in the most countries. It also offers advanced TV services under the AT&T U-verse� and AT&T | DIRECTV brands. The company�s suite of IP-based business communications services is one of the most advanced in the world. Additional information about AT&T Inc. and the products and services provided by AT&T subsidiaries and affiliates is available at http://www.att.com. This AT&T news release and other announcements are available athttp://www.att.com/newsroom and as part of an RSS feed at www.att.com/rss. Or follow our news on Twitter at@ATT. � 2012 AT&T Intellectual Property. All rights reserved. 4G not available everywhere. AT&T, the AT&T logo and all other marks contained herein are trademarks of AT&T Intellectual Property and/or AT&T affiliated companies. All other marks contained herein are the property of their respective owners.